Composite materials (composites) are engineered or naturally occurring materials made of two or more constituent materials with significantly different physical or chemical properties that preserve their autonomous identities at the macroscopic or microscopic scale within the finished structure. Disc brake pads are perhaps the most common composites. They are made of hard ceramic particles embedded in soft metal matrix. Other composites include imitation granite, cultured marble sinks and countertops. Fiberglass is another composite that is used in shower stalls and bathtubs. Advanced composites are applied in spacecraft technology where the environment is demanding. Enter magnesium oxide. 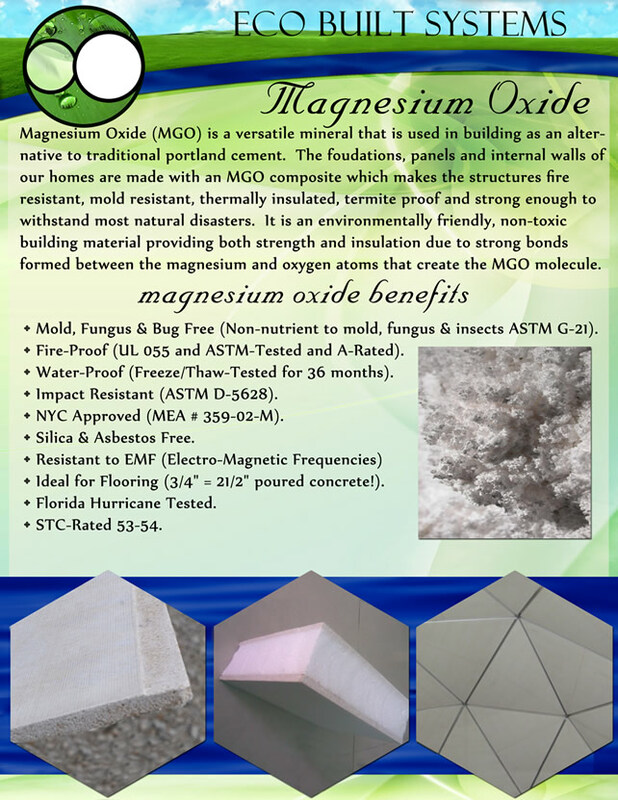 Magnesium oxide (MgO) is a versatile mineral that can be used in building among other applications and is a suitable alternative to traditional Portland cement. Foundations, panels and internal walls of homes made with magnesium oxide composite are fire resistant, mold resistant, termite proof, insulated against heat and strong enough to withstand natural disasters. Magnesium oxide has a plethora of benefits. It is mold, fungus and bug-free. This is because it is not a nutrient to mold, fungi and bugs (ATSM G-21). It is also fire-proof and has been both UL 055 and ASTM-tested and is A-rated. It is water-proof and has been freeze/thaw-tested for 36 months. It is impact resistant (ASTM D-5628). Magnesium oxide is also silica and asbestos-free. What's more? It is also resistant to Electro-Magnetic frequencies (EMF). It is also ideal for flooring: 3/4" of magnesium oxide is equivalent to 21/2" of poured concrete! Other credibility indicators of magnesium oxide are that it is NYC approved (MEA # 359-02-M), Florida Hurricane tested and STC-rated 53-54.